I've been experimenting with Microdata and thought I would try it on my blog. It turns out the template I was using already added some markup. It wasn't great and so I fixed up what I could. 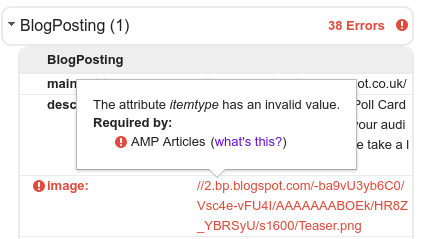 To try and push my luck I have added more markup to my latest post but Google's Structured Data Testing Tool (SDTT) is unhappy about the itemprop='image' attributes and I'm not sure why. The attribute itemtype has an invalid value. Indeed, I have just tried the SDTT with the above example code and it is failing to validate. So I'm obviously missing something. What am I doing wrong? Another discrepancy is schema.org/ImageObject recommends contentUrl, but Google recommends url, hence my usage above. Minor point, but unless you're going for XHTML, itemscope='itemscope' is wrong. Use itemscope (as you did later on). Also, /> is incorrect, even if you are trying for XHTML as this element does have children and a closing </div>. Just use > as I included in the above snippet. What is sharedContent doing here? sharedContent expects a CreativeWork when used as a property of SocialMediaPosting — never as a property of ImageObject and never on an img. Your other code snippet which places the sharedContent property as below is also wrong. Whilst sharedContent is now in the right place, it still needs to be a CreativeWork. Your ImageObjects are still not associated with the BlogPosting, as shown by the Structured Data Testing Tool. The following is the correct code.